Research is beginning to reveal that positive thinking is about much more than just being happy or displaying an upbeat attitude. Positive words can actually create real value in your life and help you build skills that last much longer than a smile. The impact of positive words on your work, your health, and your life is being studied by people who are very smart and well experienced. One of these people is Crystal Tummala. With over 2 million secretaries in the United States, she expertly portrays her opinion of Secretaries and positive words in her new book. 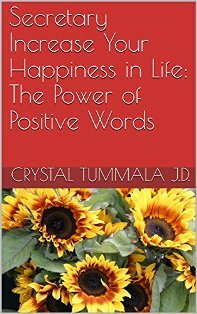 The book titled “Secretary Increase Your Happiness in Life: The Power of Positive Words” was released by Crystal Tummala on the 6th of February, 2018. Secretaries are people whose work consists of supporting management, including executives, using a variety of project management, communication, or organizational skills. In the process of trying to satisfy their bosses in the course of daily activities, they end up getting frustrated as a result of monotony and harsh attitudes of most bosses. Most also work without incentive or motivation. Words Can Change one’s brain. A single word has the power to influence the expression of genes that regulate physical and emotional stress. When we use positive words like “love", “peace" and “loving-kindness”, we can modify our brain functions by increasing cognitive reasoning and strengthening areas in our frontal lobes. Using positive words more often than negative words can activate the motivational centers of the brain, propelling them into action. On the opposite end of the spectrum, when we use negative words, we are preventing certain neurochemicals from being produced which contribute to stress management. So, when we allow negative words and concepts into our thoughts, we are increasing the activity in our brain’s fear center (the amygdala), and causing stress-producing hormones to flood our system. Motivational and biblical quotes from the author will make the profession enjoyable and enthusiastic for concerned secretaries. Secretaries lacking motivation from their various jobs can look to this book for much needed inspiration. God’s word contains power. This book is all about the positive contributions that secretaries make. Read the practical examples in this book and the accompanying scriptural references to instantly increase your happiness in life. Crystal Hutchinson Tummala was born in Pittsburgh, Pennsylvania. Apart from being a prolific author, she is also a graduate of the School of Law of Duquesne University. She has a great interest in writing. She spends her free time reading, travelling, researching and spending free time with her 6 children. She has authored various works for teachers, salesmen, truckers, chefs, advocates, and many such professionals. Her goal is to keep these professionals motivated and inspired in their various fields.